Under the new 2010 Carnegie Foundation for the Advancement of Teaching classifications, Ohio University is designated a Research University (high research activity) under the Basic Classification category. Only 99 schools - 2.1 percent - of the 4,634 schools assessed by the Carnegie Foundation are classified as a research university (high research activity). Ohio University’s institutional peers are all classified as either a research university (very high research activity) or a research university (high research activity). Ohio University’s roots are in post-Revolutionary War America. In 1786 a group of veterans petitioned Congress to purchase, through the Ohio Company of Associates, one-and-a-half million acres north and west of the Ohio River. Revenue from two townships in the Ohio Company purchase was set aside for support of a university. In 1808 the university opened with three students, and in 1815 awarded its first two bachelor’s degrees. The university graduated only 145 students in total until after the Civil War. By 1920 it had 1,072 students, but it was not until after World War II that the university began to approach its present size. In the 1950s the student population grew from 4,600 to 8,000, and the 1960s saw enrollment burgeon from about 10,000 to some 18,000 students on the Athens campus. In the early 1970s, during the Vietnam era, the student population fell below 13,000. Today the Athens campus serves about 21,000 students. Since 1946, the university’s service as the major educational and cultural institution in southeastern Ohio has included regional campuses in Chillicothe, Ironton, Lancaster, St. Clairsville, and Zanesville. Today, the regional campuses collectively enroll over 10,000 students, making the full-time, part-time, and eLearning enrollment for Ohio University over 38,000. University actual expenditures total $650 million for all of its operations on all of its campuses. 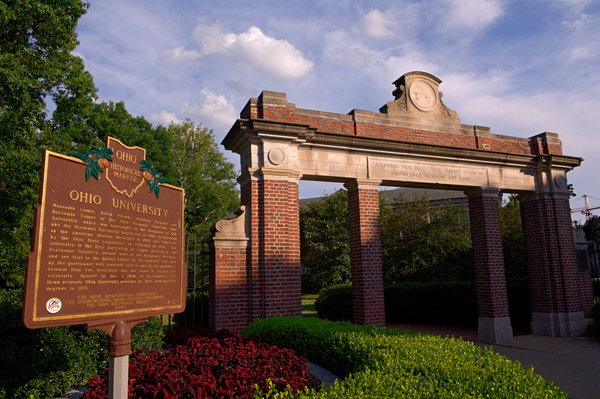 Ohio University is the largest employer in Athens County, with an annual payroll exceeding $397 million.